The Clippers are 37-29 and they continue to battle a trio of teams for a spot in the Western Conference playoffs. They have really helped their cause with a straight-up 7-3 record in their last 10 games. Tuesday’s 112-106 road victory against Chicago was their third win in a row SU, but they failed to cover as 7.5-point favorites. Los Angeles is now 2-5 against the spread in its last seven games with the total going OVER in four of those contests. DeAndre Jordan (29 points) and Lou Williams (26 points) led the way against the Bulls. Los Angeles connected on 48.7 percent of its shots from the field, but it went a dismal 8-for-29 from three-point range. Williams remains the team’s leading scorer with 23.1 points per game and Jordan’s 18 rebounds on Tuesday eclipsed his team-high average of 15.3. The Clippers are ranked seventh in the league in points (109.4) and 12th in rebounds (44.0). Houston has opened-up a two-game lead at the top of the standings in the West at a NBA-best 53-14. Its recent 17-game winning streak came to an end last Friday in a road loss to Toronto, but the new streak stands at two games both SU and ATS with back-to-back victories against Dallas at home and San Antonio on the road. The Rockets are 26-6 SU at home this season, but they are just 3-5 ATS in their last eight home games. The total has stayed UNDER closing line in their last four games overall. The combination of James Harden and Chris Paul has been almost unstoppable at times with role players such as Eric Gordon, Clint Capela and Trevor Ariza contributing heavily to Houston’s success this season. Harden continues to lead the NBA in scoring with 31.0 PPG and Paul is averaging 18.8 points and 8.1 assists a game. 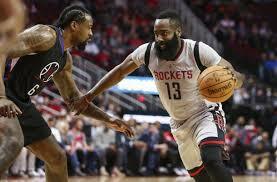 The Rockets are the second-highest scoring team in the league with an average of 113.7 points.